We’re celebrating the first Sunday of Advent this evening! I haven’t been able to work up the energy to think about doing the usual Christmas decorating, but I’ve had fun planning some new traditions for Advent. This season is all about joyful patience and anticipation, celebrating both those who waited for Jesus’ birth and our wait for his return in glory. The first tradition we’re instituting (after intending and forgetting since 2008) is lighting Advent candles every Sunday night. I found these cute little glasses at Goodwill and I love them, but I’ll have to remember to look for better purple and pink votive candles next spring so I can stock up for next year. The other thing we’re trying is a Jesse Tree! This is a twist on a Christmas tree, where there is a new ornament to hang every evening that corresponds with a devotional reading. Or maybe Christmas trees are a twist on the Jesse tree. Either way, we’re doing one of these this year in place of a usual evergreen. It would be awesome to have the same ornament tradition with a Christmas tree, but I am feeling very lazy about putting that together for now. I’m excited about this because a Jesse tree is a tangible way to celebrate the lineage of God’s faithfulness throughout history leading up to Christ’s birth and learn from those who faithfully waited for the promised Messiah. I think it will take a few years to collect a full season’s worth of ornaments, so some of mine will be pieces of paper or drawings for now! 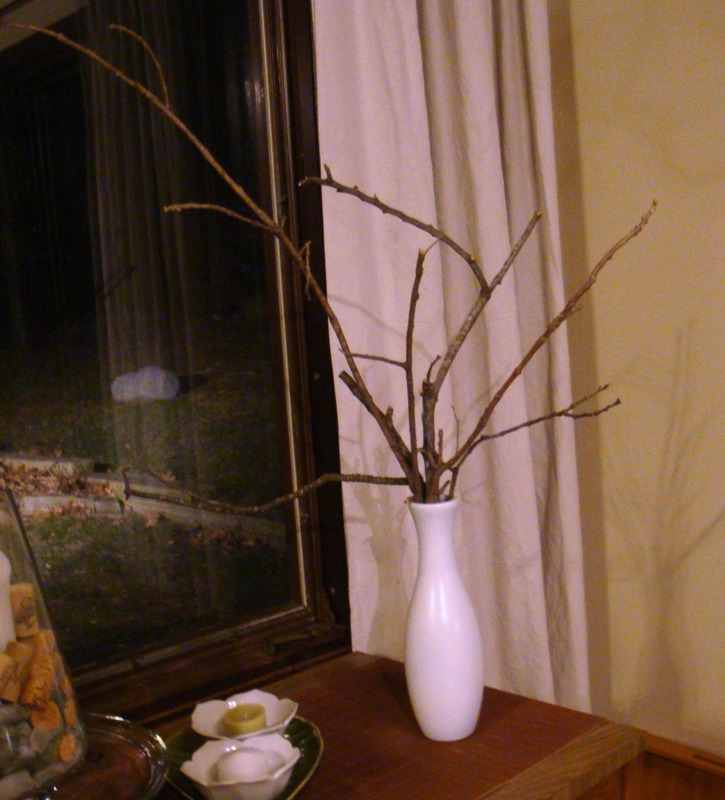 From the looks of this picture I will need to some better branch hunting tomorrow, too. Oh well! This is what it looks like for now, and I already started making an ornament for the reading on Monday. these branches of the jesse tree are ready for ornaments! 1) This is a fun song from singer/songwriter Andrew Peterson about the genealogy before Christ. It’s a great musical expression of the things we’ll spend some extra time meditating on this month. 3) I love this article on Advent from Bobby Giles and these Advent prayers from the Gospel Coalition. It is marvelous that Christ came and is coming again – we are blessed to contemplate these mysterious gifts! There shall come forth a shoot from the stump of Jesse, and a branch from his roots shall bear fruit. And the Spirit of the Lord shall rest upon him, the Spirit of wisdom and understanding, the Spirit of counsel and might, the Spirit of knowledge and the fear of the Lord. -Isaiah 11:1-2, esv. I love your candles and the Jesse Tree! I’d love to do that sometime but my husband and I think we’ll do it with our kids and probably use a real Christmas tree. Thanks for sharing those links, too. I’m going to subscribe to Ann’s blog. Thanks for visiting my site and God bless your Advent season! I think a hybrid celebration of Jesse-Tree ornaments on a regular Christmas tree would be pretty ideal! We’ll be out of town for the holidays so I’m taking the easy way out because I didn’t feel like setting a whole tree up this year. You can order a set of ornaments from many places online, but I’d like a variety so it will probably take a while to collect enough… you might think about getting yours together soon if you want! Enjoy A Holy Experience – it’s such a gift. Have a blessed Advent!